If you haven’t caught the Valentine’s Day spirit yet, this is the week to do it, and here’s three stories to start you off! Can Ben convince Darby to consider him for more than just a place on the gallery walls? Available at http://www.thewildrosepress.com and on Amazon. Love is in the air! Devlin is not your typical ex-seal…since he’s half werewolf. And Summer is not your typical yoga studio owner, since she’s an elemental witch. When they meet, sparks fly, literally, but sharing their supernatural secrets is not something either of them do easily. They can’t stay apart for long, and Divide, Colorado, really heats up when this alpha male mates with this bewitching female. Ms. Stetler brings us very likable characters in a number of scenes so well described, the reader feels right there with them — at the gun shop, on the ski trail, at Devlin’s enticing mountain lodge home. If you want a little magic, more heat, and a traditional happy-ever-after all wrapped up in one delightful Valentine’s Day package, Charm Me is for you. Choose–in order, adults-only hot; sweet; or spicy as January heats up with these next three titles. Regina is a romance writer in need of research. Tucker is a Dom with a spanking bench. Who tops whom? 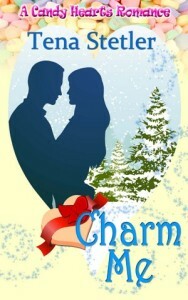 Back from a tour of duty, can he convince her that he wants her to be his for Valentine’s Day, and ever after? Alex had sworn off love–until candy hearts mysteriously arrive in her mailbox. What’s better on a cold January day than some warm romance? Here’s the second set of title releases from The Candy Heart Series published by The Wild Rose Press. Can a ski trip turn romantic in Divide, Colorado? Can one sweet kiss revive an old love? Purchase at http://www.thewildrosepress.com or on Amazon. More happy reading! Today: First Three Releases for Candy Heart Series! Get ready for Valentine’s day romance and love! 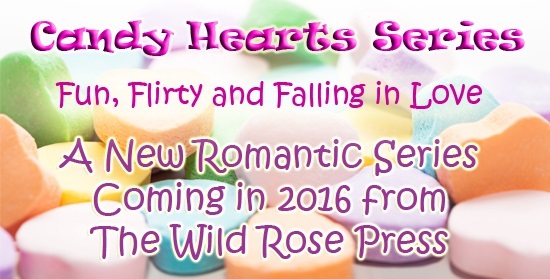 The Candy Heart Series from The Wild Rose Press debuts today. Andi must choose to meet the guy she’s secretly admiring or the one that’s admiring her. Can a time traveler and the widow of a murdered earl find love in Regency London? Books can also be purchased at Amazon and Barnes and Noble. Happy reading!